The Green Lacewing will eat almost anything that moves and is a little smaller than it is. This makes Green Lacewings a great tool for insect eradication. The only problem is that as soon as all of the food is gone, the Green Lacewings go off somewhere else to find some more. Compared to Ladybugs these guys rock. They have a wider palate. They will eat Most anything that is the right size. I have used them to eat aphids, psyllids and whiteflies. With the giant whitefly, a combination of spraying off the hairs with water and releasing the Green Lacewings helped a lot. But you have keep spraying off the hairs because the lacewings get tangled in them. It is recommended that lacewings be released every 2 weeks until they have taken care of the problems. The object is to flood the local environment with predators until there is no prey. Each lacewing larvae will eat as many as 1000 eggs or other insects. And each adult will lay as many as 200 eggs. Got a big problem, do the math. There is a lot of lacewing potential. Adults live 4 to 6 weeks. Eggs take about 5 days to pupate. Larvae are the biggest eaters and live in this stage for 1 to 3 weeks. Green Lacewing on the window of my truck - Chrysoperla rufilabris. High resolution photos are part of our garden image collection. 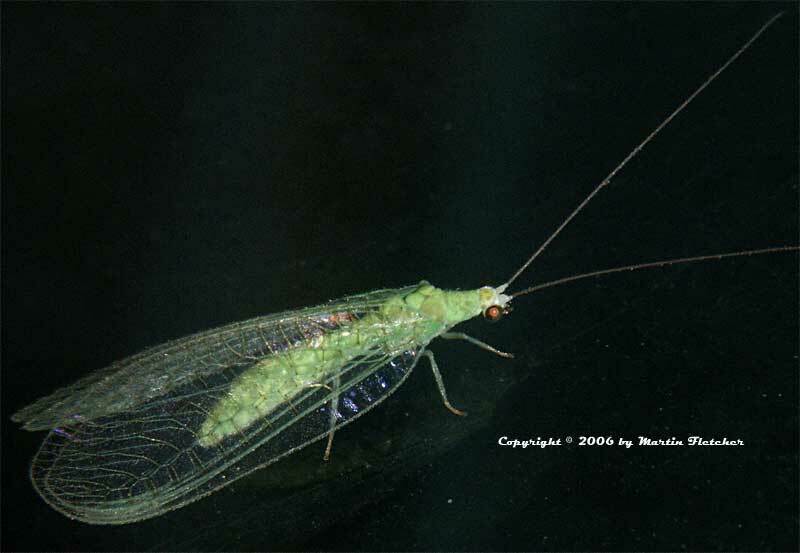 High resolution photos of the Green Lacewing are part of our garden image collection.